I had hoped to travel down to the National Mall to visit the cherry blossoms this year, but due their late arrival and an impending deadline this week, I don’t think I’m going to make it. 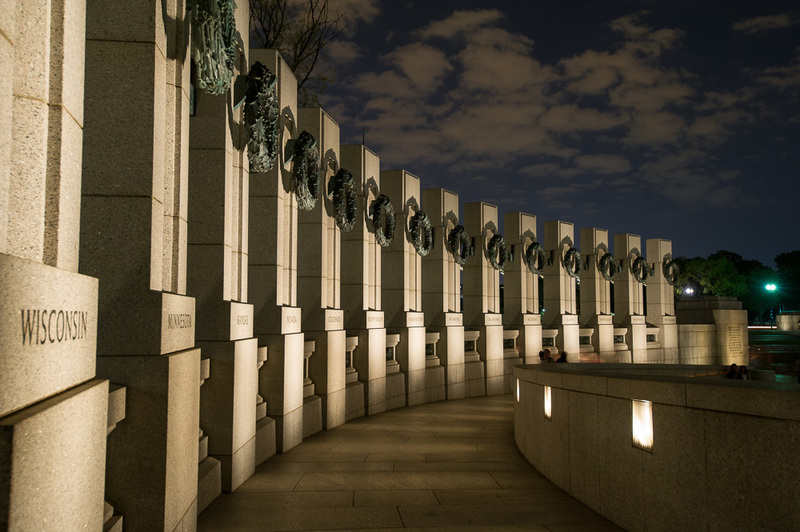 This beautiful memorial was dedicated in 2004 and is one of the newer installments on the Mall; it’s the only 20th century event commemorated on the National Mall’s central axis. If you have the chance to visit this memorial, try to do so in the evening when the sun sets. You’ll have a gorgeous view of the Lincoln Memorial and Reflecting Pool, the Washington Monument and Capitol building all bathed in blazing colors. This photograph was taken later in the evening, with a long exposure to merge the sky and clouds into the image. Editing in Lightroom. Nice picture that you have taken. An evening on Mall that behins with watching the sunset is a greay venture. I try to attend an eveninh military band concert once a year.It can stir the soul and provide a healthy dose of pride on our fabulous county. The mall is one of the few things I miss frkm working in DC. Love your photos and the way you “see” them! Thanks for sharing, they are awesome…. Thank you for the kind words! I am always learning more and trying to see in new ways. I appreciate your flower, too!